RTDs (Resistance Temperature Detectors) are the most common, most versatile temperature sensors in industrial and process applications. They are stable, have good repeatability and work well within a wide range of temperatures. The electrical resistance of some materials is different at different temperatures. When known, the relationship between electrical resistance and temperature of the material can be used to assess an external temperature. RTDs take advantage of this property and use a wire made of platinum, nickel, or copper to measure temperature in a process. There are 2 wire RTDs, 3 wire RTDs and 4 wire RTDs and selecting which type to use depends on your temperature measurement requirements. In a basic 2 wire RTD, the circuit adds the resistance of the lead wires to the resistance of the RTD. This means the read temperature value is not exactly the real temperature value. This added resistance may be a concern, particularly in applications that require a certain level of accuracy and when the RTD is not located close to the transmitter, requiring long lead wires. Therefore, 3 wire RTDs have become the industry standard when greater accuracy is required. To compensate for lead wire resistance, 3 wire RTDs have a third wire that provides a measurement of the resistance of the lead wire and subtracts this resistance from the read value. This correction compensates for the effect of the resistance of the long lead wires on the temperature measurement and results in improved accuracy. Because 3 wire RTDs are so effective and affordable, they have become the industry standard. They are used in a variety of industrial applications and processes, especially in refineries and chemical and petrochemical plants where temperature monitoring and control is of extreme importance. 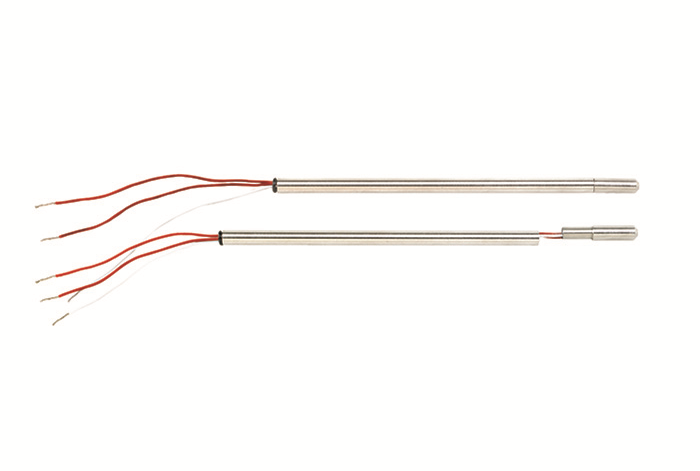 The 3 wire RTDs provide good accuracy and repeatability at reasonable cost and have been adopted by all major temperature transmitter manufacturers as the standard type of sensor for most applications. WIKA has vast experience in RTD design and manufacturing, and is today one of the main suppliers of 3 wire RTDs. The company offers an extended selection of materials, connection heads, insertion lengths, and process connections that can be configured to fit the particular requirements of each application. The TR10 series, for example, which features 2 wire RTDs, 3 wire RTDs, and two types of 4 wire RTDs, can be inserted directly into the process or can be mounted in several thermowell arrangements. TR10 RTDs have ingress protection and are intrinsically safe. They are explosion-proof and can be used in hazardous locations. Available sheath materials include a variety of corrosion-resistant and high-temperature, oxidation-resistant options. TR10s are a good choice for most industrial and commercial applications in chemical and petrochemical plants, the oil and gas industries, power and utilities, the pulp and paper sector, and machinery and tank measurements. WIKA’s RTDs are manufactured according to DIN EN 60751 specifications and have very good standard resistance to vibration. WIKA’s experts can also custom design RTDs to withstand higher than usual vibrations such as those commonly found in gas compressors bearing assemblies. WIKA’s RTDs can be supplied with or without a WIKA temperature transmitter. They work perfectly well with temperature transmitters made by other manufacturers. Contact WIKA’s experts today. With years of laboratory and field experience, they can help you find a 3 wire RTD or another type of RTD to suit your particular needs.